This post contains some affiliate links. This means that if you decide to click through and make a purchase, I might receive a small commission that goes back into keeping the blog running and developing more free recipes for you all. Thank you for your support. Have you heard of 'hygge'? It's pronounced something like 'hoo-gah'. Aherm. Let me back up a little bit. Denmark, according to various reports, is one of the happiest countries on Earth. Norway, Iceland and Finland also achieved top 5 places in the report. So what are they doing in these Scandinavian countries that people are missing everywhere else? Some people think it's to do with hygge. Hygge is a word that is loosely translated as 'cosiness'. Snuggling up in a blanket while you read your favourite book. Enjoying a cup of tea in a tent with fairy lights on. Eating dinner in bed. Cuddling up with the kids and watching an old Disney film. These are all things to do with hygge. And it's a way of life in countries like Denmark, who are proud to practice it regularly. And as you're rewarding yourself every day with indulgent cosiness, then your happiness levels are bound to increase, right? I think we can all apply a bit of hygge to our lives and hopefully become happier and more content. The more I look around, the more I see people shuffling past me, rushing on their way to work or school. We go to work to earn money to pay for holidays complete with wi-fi, all-inclusive food and drink and entertainment. When we're at work, we're wishing we were on holiday. When we're on holiday we're thinking about what we're missing (and what we'll probably come back to) at work. And probably using all that free wi-fi to check up on things once in a while. We come back to work having to work overtime either to pay for the holiday we just had or to pay for the same holiday we'll have next year. Sometimes it just feels as if we need to just STOP. And not with material things, but with simple, child-like things that comfort the soul. Remember when you were a kid and wrapped yourself up in a massive blanket and slept on the sofa propped up with cushions when you weren't feeling quite right? The wrapping up bit felt great. That's hygge. Do you go on holidays? We did, a few years ago - we had a weekend by the sea. But now I look back, I see that we did it all wrong. We drove for nearly three hours through rush hour on the Friday night after work, and stayed in the cheapest family hotel we could find. We slept on puffy, rustly pillows for a spendy £200 per night, updated our Facebook a few times each day just to prove we were there (hello again, free wi-fi), visited the local sights, aquariums and fairground. We dropped endless coins into the slots in the arcade. We built sandcastles on the beach and took a blustery stroll along the pier. We got up early, charging around visiting museums and queued up to get fish and chips at the shop on the beach front. We stayed for two nights, cramming everything in that we thought we should be doing, you know, seeing as we were 'on holiday'. When it was time to head home, we were all exhausted, and had seriously maxed out the credit card. We agreed that we'd have to work overtime for a while to pay for our Fantastic Beach Weekend. Still, we had the memories, didn't we? And everyone was doing this, weren't they? This was normal. This is just what people do. When I asked my children what their favourite part of the school holidays were, their answers surprised me. Snuggling up on the sofa watching their favourite film. That day we drank hot chocolate and watched the stars come up, spotting each one as it twinkled through the navy blue sky. Going to the swimming pool down the road when Daddy got them all to jump off the deep end. But what about the weekend away? Over the years I've realised that some of their favourite memories are softer, cosier things that we've done at home. And there's nothing wrong with that. We put up a tent in the back garden and watched the moon come up (we chickened out on sleeping out there and all went back in the house when mosquitos started to strike). We had a lot of barbecues - some with friends, some last minute ones with just us and whatever we could find in the fridge - and we built a den out of blankets and books and ate dinner in it. (Top tip - books make great walls, if you stack them up.) We've had days out, too. Although we don't go on proper holidays very often, we're all happy. We're kind of low-maintenance. If we don't have the money spare to go on holiday, we'll do days out instead. Or pitch a tent in the garden to sit in, even if we don't ever sleep in it. And so I think we live with a kind of hygge. We all make sure we do something we love, every day. Something that kind of nourishes the soul, whatever that is. My daughter loves drawing. My other daughter loves playing the violin. I love watching The Musketeers in the dark, propped up with big cushions with a cup of Earl Grey and the fairy lights on. Finding modest ways to treat my soul makes me happier, less stressed and helps me sleep at night. My health is better than it used to be and while eating healthily has played its part, I'm pretty sure some of it is the hygge. See if you can adopt a kind of hygge into your life. Do something cosy that you enjoy. Wear the woolly socks. Weave twinkly fairy lights up the bannister. Make a den in the back garden. Take your breakfast back to bed. We are planning a family holiday away sometime next year. And while they can keep the free wi-fi, I think I'll definitely take the hygge with me, this time. How about you? What do you think of the hygge lifestyle? What kind of things do you do that are hygge? 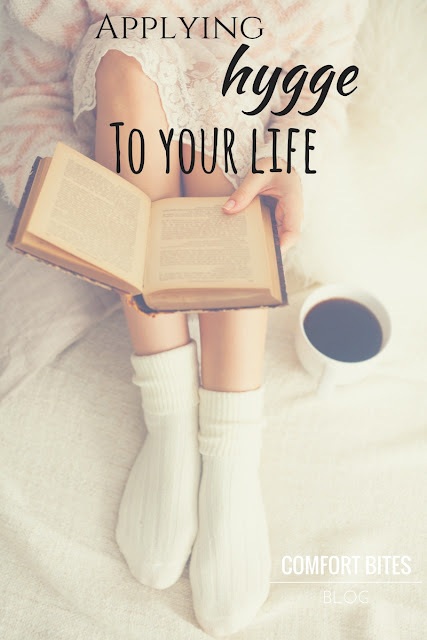 Some books you might find useful on Hygge - all of these are on my wishlist!